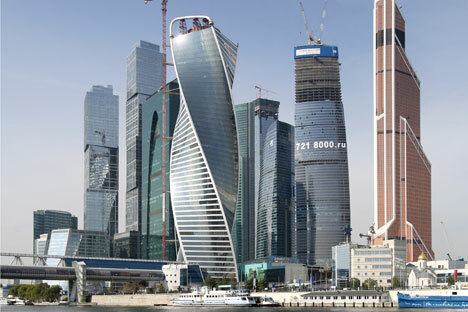 Financial future: the Moscow-City business center is still partly under construction. Economic crisis: After a year of unprecedented economic turmoil, the country is in calmer waters but there are still challenges ahead. In the wake of sharply declining oil prices, a ruble that almost halved in value and the imposition of economic sanctions, many believed 2015 would witness a default in Russia like that of 1998, with banks collapsing, inflation going through the roof and ordinary people facing catastrophe. Those fears were not realized. Russia’s economy took a battering and real incomes were bruised this year, but as 2016 comes into sight, the economy has started to slowly pick up again. “Quarterly evaluations show that the recession, as it is defined, is over,” Alexei Ulyukayev, Russia’s Minister of Economic Development, said at a meeting with European diplomats in Moscow last month. Foreign experts echoed his statement: the credit rating agency Standard & Poor’s (S&P) reported 0.5 percent growth in the third quarter after almost four quarters of decline, and predicted that growth would continue. But Russian analysts remain cautious, warning that the crisis is not over yet and that there’s a long road ahead for the economy to get back to where it was in the late 2000s. Currency hardships began in December 2014, the second “Black Tuesday” in the country’s history, when the rouble fell 41 percent against the dollar and 34 percent against the euro. The Central Bank of Russia, the financial regulator, reacted quickly – and at the time controversially – by raising its key interest rate to 17 percent from 10.5 percent, eliciting outrage from politicians and public figures. The regulator “shot dead the Russian economy, to spare its suffering,” oil giant Rosneft’s spokesman Mikhail Leontyev said at the time. Within a couple of months, currency rates had stabilized, though with oil prices having fallen from around £50 a barrel in November 2014 to less than £30 in August 2015, euro and dollar exchange rates stubbornly remained almost twice those of mid-2014. The euro was worth 70 rubles compared with 46 and the dollar more than 60 rubles instead of 35. Yet it didn’t get worse, thanks to the Central Bank’s policy, according to Alexander Abramov, an investment expert at Moscow’s Higher School of Economics. “The bank acted vigorously, and the fact that we have a relatively stable currency rate and a moderate inflation rate we can credit to them,” he said, adding that another Black Tuesday this year was highly unlikely. At the same time, the Central Bank could only do so much, given the circumstances and condition the country’s economy was in facing sanctions and low oil prices, says Vladimir Bragin, chief analyst at Alfa Capital. A weaker ruble prompted rising prices and inflation. People’s real incomes sank significantly, which led to a drastic drop in demand for bank services. In the first six months of 2015, the residential mortgage market dropped by a total of 40 percent, and banks earned eight times less from issuing loans than in the same period in 2014. With the Central Bank withdrawing licenses of small banks almost every month, ordinary Russians feared for their savings and depositors rushed to withdraw cash from their bank accounts. The dreads word “default” re-entered the Russian vocabulary. But fears were overstated. When S&P issued its report with positive numbers in November, officials announced that Russia was out of recession. The report reflected a growing confidence that Russia’s fiscal managers had successfully negotiated the crisis. By September, Central Bank head Elvira Nabiullina had even been named best head of a central bank in 2015 by Euromoney magazine. Nabiullina, according to the magazine, fought the “macroeconomic storm” by implementing “moderate policies” – raising the key interest rate, carrying out measures to strengthen the ruble and giving financial institutions access to additional liquidity. Euromoney concluded that Ms Nabiullina’s economic “therapy” had worked. Dmitry Miroshnichenko, an expert at the Centre for Development Institute of the Higher School of Economics, agrees. He says that the Central Bank stabilized the situation and is now in control. It’s too early to judge whether Russia’s economy will continue to grow – the results of the fourth quarter will not be available for a while yet, and Russia’s economy remains dependent on oil prices – meaning a breakthrough is only possible if they rise, he says. Bragin sees room for a bit more more optimism. “I think we have come to a point of economic restoration. Even taking the rate of inflation into account, companies have started earning more money. I believe next year the dynamics might surprise us,” he says. Yet the damage the economic storm has done is obvious. According to a World Bank report in late September, the number of Russians living below the poverty line in 2015 reached 14.2 percent – compared with 11.2 percent in 2014. “It is the first significant rise in the number of poor in Russia since 1998-99,” according to the report. Former finance minister Alexei Kudrin believes the Russian government needs to tackle structural reforms – such as raising the pension age, cutting public spending and reducing support for state-run companies – if it is to avoid further trouble. “After the crisis, the economy will face stagnation, because there haven’t been any structural reforms. That’s the most serious challenge that the president faces: stagnation of the economy for the next five years,” Kudrin said during a round-table event devoted to the 15th anniversary of Vladimir Putin first being elected president in March. Why is Russia’s Central Bank planning to print 1 trillion rubles?